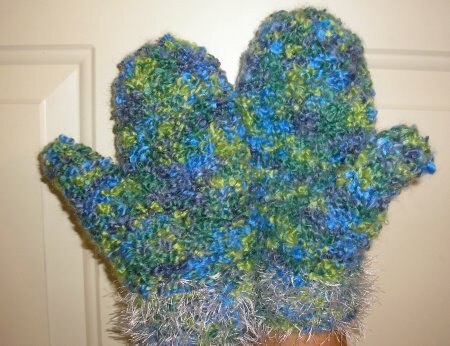 Finally the Chunky Knit Mittens are finished!! Pour SMORE BAR mix in large bowl. Melt 1/2 cup butter, pour over mix. Add 1 tsp. vanilla; mix. Place in greased 9×9 baking pan. Bake for 15 minutes at 350.
geocities.com/giftsinajar – tons of recipes and wonderful tips. I have to admit, though, when I get a gift in a jar I rarely eat them. OK, I don’t eat them.. anymore. See, a couple times I’ve opened it up and the stuff tasted like crap. The way the ingrediants are packed in like sardines kind of grouses me out. When you attempt to empty the jar, each layer resembles a hockey puck, clanking against the rim, screaming for Sharon Stone and her ice pick. Turned me off of eating them. So if anyone has some recipes that are actually GOOD to make and consume, I’m all ears. Maybe you can convince me. If YOU get a gift in a jar, do you actually consume it or do you toss it? Remember that earflap hat I was working on? Well, it is finished. It is basically this pattern with some variation (because I can’t seem to just follow a darn pattern, got to stray a bit). Mainly I went a bit larger because of the big hair issue I have. I used Bernat Softee Chunky in Carnival. I’ll try and note the changes I made in red, but about half-way through I stopped writing them down. First, you have to make the ear flaps. With two double point needles cast on 2 stitches. Purl 1 row. Work back and forth in stockinette stitch. Every time you do the knitting side, increase the first and last stitch. This will create the triangle shape. Keep going until there are 16 stitches for the XS, 18-S, 20-M, or 22-L 26-XL. Place these stitches on a holder. Make sure to make two! Hat: With the circular needle, cast on 12-XS, 14-S, 16-M, or 18-L 22 stitches for the back of hat; knit across stitches of the first ear flap. then cast on 20-22-24-or26 30 stitches for the front; knit across second ear flap. There will be 64-72-80-or 88 101 stitches in all. Join stitches carefully without twisting. Knit 2 purl 2 on the front and back part of the hat (regular knit the ear flaps) for four rounds. This will make the nice ribbing and will prevent the hat from curling up. I’ve finally made the transition from MT over to WordPress. Comments were always such a headache with MT, but I liked the format. This will take a bit of getting used to. I still have some tweaks to do, too. Knitting: Working on a hat with ear flaps. Due to the girth of my hair, I need a large hat. I can’t seem to find large hats!! Frustrating. So, I decided to make my own. This is the first time that I’ve worked (successfully) with circular needles. Progress Picture? Edit: Update, finished hat is here.